Turns out humanity doesn’t have a monopoly on self-destructive behaviors. Image credits Chris / Flickr. One glacier in Iceland is putting out large quantities of methane, a powerful greenhouse gas, a new study reports. 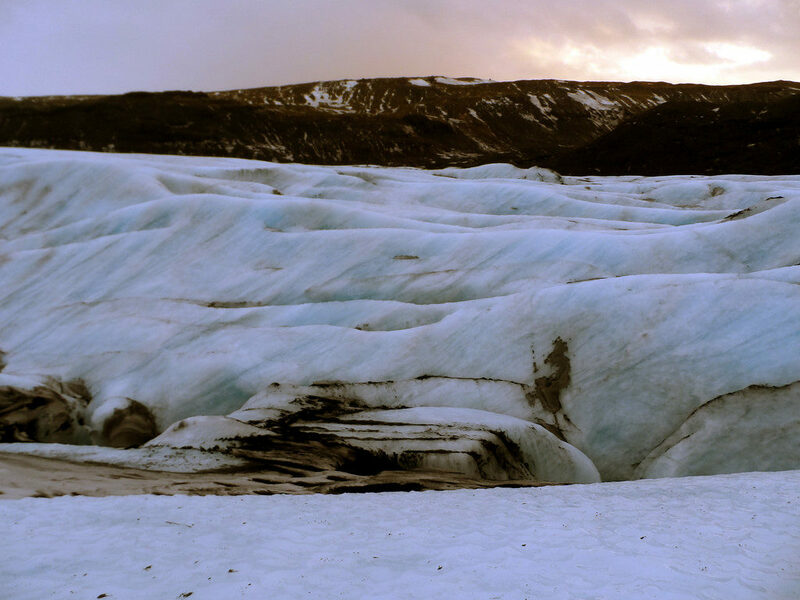 The Sólheimajökull glacier — which flows from the active, ice-covered volcano Katla — generates and releases about 41 tonnes of methane (through meltwater) each day during the summer months. That’s roughly equivalent to the methane produced by 136,000 cows, the team adds. “This is a huge amount of methane lost from the glacial meltwater stream into the atmosphere,” said Dr. Peter Wynn, a glacial biogeochemist from the Lancaster Environment Centre and corresponding author of the study. Methane is a much more powerful greenhouse gas than carbon dioxide (CO2) — 28 times more powerful, to be exact. Knowing exactly how much of it makes its way into the atmosphere thus becomes very important, both from an environmentalist and a legal point of view (for cap-and-trade or similar systems). Whether or not glaciers release methane has been a matter of some debate. On the one hand, they’re almost perfectly suited for the task: they bring together organic matter, water, and microbes in low-oxygen conditions (all very conducive to methane), capping them all off with a thick layer of ice to trap the gas. On the other hand, nobody had ever checked to make sure. So the team decided to take the matter into their own labs. They visited the Sólheimajökull glacier in Iceland to retrieve samples from the meltwater lake it forms. The team then measured methane concentrations in the samples and compared them to methane levels in nearby sediments and other rivers, to make sure they weren’t picking up on environmental methane emissions from the surrounding area. “The highest concentrations were found at the point where the river emerges from underneath the glacier and enters the lake. This demonstrates the methane must be sourced from beneath the glacier,” Dr. Wynn explains. Subsequent spectrometry analyses revealed that the methane was generated by microbial activity underneath the glacier. However, the volcano also has a part to play here. It doesn’t generate methane directly, but it “is providing the conditions that allow the microbes to thrive and release methane into the surrounding meltwaters,” explains Dr. Wynn. The thing is that methane really likes oxygen. It likes it so much, in fact, that whenever the two meet they hook up into CO2. What generally happens with glaciers is that oxygen-rich meltwaters seep to the bottom and convert any methane trapped there into CO2. At Sólheimajökull, however, most of the oxygen in this meltwater is neutralized by gases produced by the Katla volcano. The methane remains unaltered, dissolves into the water, and escapes from under the glacier unscathed. Heat from Katla also keeps the environment cozy for the microbes living under the glacier and may “greatly accelerate the generation of microbial methane, so in fact you could see Katla as a giant microbial incubator,” adds Dr. Hugh Tuffen, a volcanologist at Lancaster University and co-author on the study. Such active, ice-bound volcanoes and geothermal systems are abundant in both Iceland and Antarctica. The present paper suggests that these systems can have a meaningful impact on our climate projections. Katla “emits vast amounts of CO2 — it’s in the top five globally in terms of CO2 emissions from volcanoes,” Dr. Tuffen explains. “If methane produced under these ice caps has a means of escaping as the ice thins, there is the chance we may see short term increases in the release of methane from ice masses into the future,” says lead author Dr. Rebecca Burns. However, the team says it’s still unclear such processes will play out in the context of climate change. There could be a short-term spike of methane released while glaciers melt and thin out, but the process may be self-limiting in the long-term: without ice, the conditions for methane production are removed. The paper “Direct isotopic evidence of biogenic methane production and efflux from beneath a temperate glacier” has been published in the journal Scientific Reports.